FLORA - MURALS - INTERIOR DESIGN - SWIMMING POOL - SWIMMING POOL MURALS. 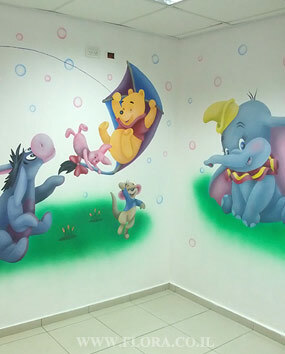 WALL PAINTING OF THE WINNIE-THE-POOH, TIGGER, PIGLET, ROO AND EEYORE, DUMBO. Swimming pool Murals. Wall painting of the Dumbo, Winnie-the-Pooh, Tigger, Piglet, Roo and Eeyore from Winnie the Pooh story. Location: Lobby of the swimming pool Dereh HaMaim in Ashdod. Muralist: Flora.